If there was one vegetable you could vote to be the most useful of the lot, I would say potato. We Indian’s did not invent it, but we Indian’s surely know how to make full use of potatoes, be it bhaji, sabzi, paratha, accompanied in Chicken or Mutton curry or even with cauliflower and best of all a spicy, flavour ful dish on it’s own Aloo Dum. Even Wikipedia has directions to make Aloo Dum, no kidding. Potato, was not on the high priority list of vegetables for the Bengalis, it still really is not. Warren Hastings , the Governor general in 1790, received a basket of potatoes as a novelty gift from the Dutch , who took the credit of introducing potatoes to Bengal. The Story goes that Lord Amherst , had potatoes planted in the “Park of Barrackpore”. Bengalis took to the root vegetable with much enthusiasm. The starchy softness of the potatoes worked well as a perfect contrast to sharp taste of mustard seeds and cumin used in Bengali cooking. 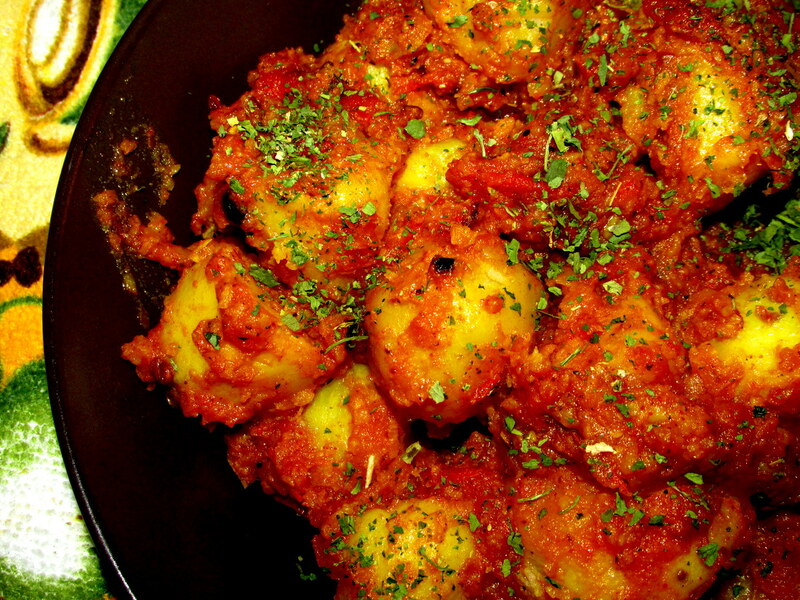 The Bengali aristocracy adopted “potato” as symbol of superiority and westernized cuisine. By 1860, it was the main ingredient in the region’s cooking. Potato slowly started traveling inland from Bengal. The “Nanbais” recreated their ” Dum Pukht” on the western fringes of the “Hugli” using simpler methods . 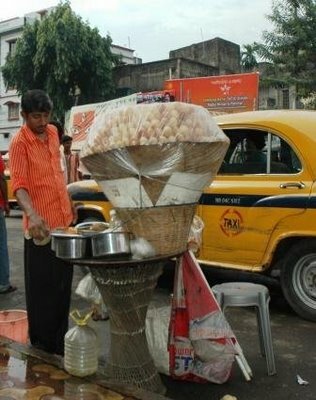 Instead of cooking over night, they incorporated the Bengali technique of dry steaming . Spices were replaced, dry ginger and fennel powder gave way to roasted cumin and potato replaced turnips and thus the “Aloor Dom” was born. This particular recipe was obtained from a blogger friend and a fantastic cook, Pritha Sen. She shares this simple yet mouthwatering recipe from the streets of Kolkata. Aloo Dum has many variations but this one would remind you Vivekananda park, Lake Kali Bari road where the roadside stalls would come up with some gorgeous fiery dish that leaves you all teary not to mention pining for water on one hand and asking form seconds on the other. Boil and peel the potatoes, make sure you add salt to the water, I like boiling my potatoes in a pan rather than a pressure cooker. Next in a wok or kadhai heat hoil once it is ready add the methi seeds, as they start sizzling, nest add the ginger garlic crush and saaute till the raw smell is gone. Now add the chopped tomatoes and let it cook till it is all pulpy and mushy. next here I added 3 teaspoons of Chettinad masala ( mine is home made) in case you do not have it add garam masala 1 teaspoon, next add the turmeric and red chilly powder, followed by the coriander powder. 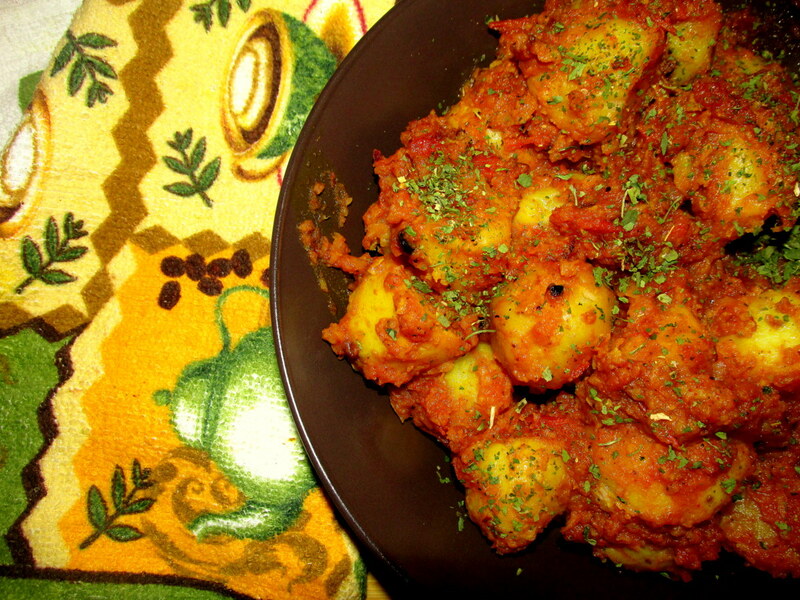 Once the oil starts to separate from the masala add the potatoes. once they are well coated with the masala and there is a thick trail of gravy, the aloo dum is ready. Serve with roti, puri/ luchi or even paratha. Heat a frying pan without oil. Next in low flame , fry cardamom, coriander seeds, cinnamon stick, cloves ,roasted chana dal. After roast remove these items from pan.Then fry dry chili till get a dark color Only after turn off the flame add poppy seeds. Grind well all these fried items together. How I wish we embarked upon culinary adventures together when both of us were in Delhi! I am going to try it your way soon. Can you please give pritha sen’s link from where you got the original recipe ..